Hello! It's September already! And time for the first ever home♥stitch♥ness giveaway! This will be a pattern of the winner's choice AND I will even kit it up for you with all the threads you'll need, plus either the linen (same as the model was stitched on) or a comparable colour of aida, if you prefer to stitch on aida. This will be a pattern of the second prize winner's choice. I am interested to know which design is your favourite! If you haven't already, you can view the home♥stitch♥ness pattern range here or pop on over to my Etsy Shop to read more about the actual charts. This time last year, I was busily working towards getting everything ready for the home♥stitch♥ness launch in March/April 2013. As the models were being photographed and I was proofing the patterns before printing, I was searching the internet for a bulk supplier of tiny, red star buttons to include with the Four Seasons in New Zealand chart. On this design, I had originally stitched four red star buttons onto the NZ flag and they added such character to the overall look of the design that I just HAD to include some with the chart. I was one very happy girl the day my button order arrived in the mail and I relished the task of counting every last one of them. Yes, I did - twice, even! All you need to do to be in to win the first prize is to take a guess as to how many red star buttons were in my order. The person who makes the closest guess will win first prize. If, in the unlikely event of more than one person guessing the exact number, the correct guesses will be put into a basket and a winner drawn. Guess how many red star buttons there are? 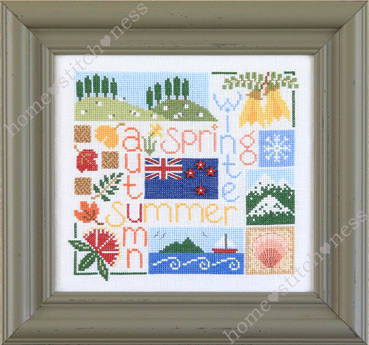 The giveaway will finish on Wednesday, 25th September (NZ time) Good luck with your guess and thanks in advance for helping to spread the word about the new home♥stitch♥ness cross stitch pattern range! I will guess 248. I love the four seasons sampler! I am now following you on Bloglovin too! You are so talented Jennifer!! I feel so excited for you! So many beautiful patterns, I really like the Kowhai Cottage. 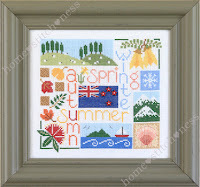 "Such lovely cross stich pics, I have dabbled in embroidery but never done a real cross stich, maybe I will win one! I reckon there is 152 stars." "Oh opps, forgot to say I would like the Pohutukawa one. colourmegorgeous@hotmail.com"